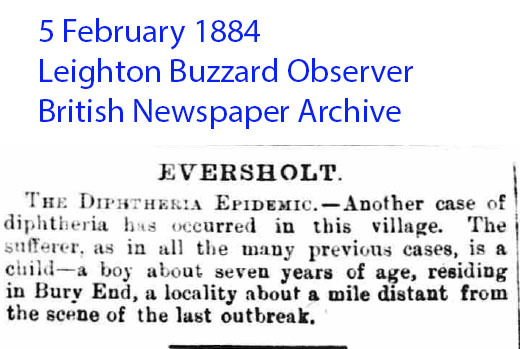 Diphtheria also having occurred at Eversholt during the summer of 1883 and beginning of 1884, Dr. Parsons found that some of the first cases (which were fatal and involved children) had been recognised, whilst others had been registered as quinsy and ‘putrid sore throat’. Suspicious sore throats amongst adults had preceded these cases, and a school-treat took place at which during a shower some hundred children had congregated in a cowshed, surrounded by manurial nuisances. The first cases were present on this occasion and most probably contracted their infection from the assemblage. It is also noteworthy that cases of scarlatina preceded those of diphtheria. Histories are related where children in whom the false membrane had not yet developed, but were ailing with corysal symptoms infected others, this suggesting an early infectiousness of the disease, similar to measles and whooping-cough. The sanitary condition of the school-house was found virtually free from blame, the only suspicious conditions being the presence of an open drain at the back receiving farmyard refuse, and the emptying of a contiguous over-full cesspit, the content of which were placed near the school. The history of the early cases could not be made out, but throat illness of various degrees seemed to have preceded the first undoubted case of diphtheria. Some of the residents at the school were attacked at this time with scarlatina, and cases had existed in the parish in 1883, so that Dr. Parsons supported the hypothesis that the first case caught his diphtheria from scarlatinal cases, a connection which, with its obverse, he had noticed elsewhere. Who died? How many? Any ideas? It’s remarkable that ordure from a cess pit was dumped near the school without anyone thinking it was unwise! The cess pit presumably belonged to Linden Farm, where the End House is now. xvii. Cases 32 to 36. 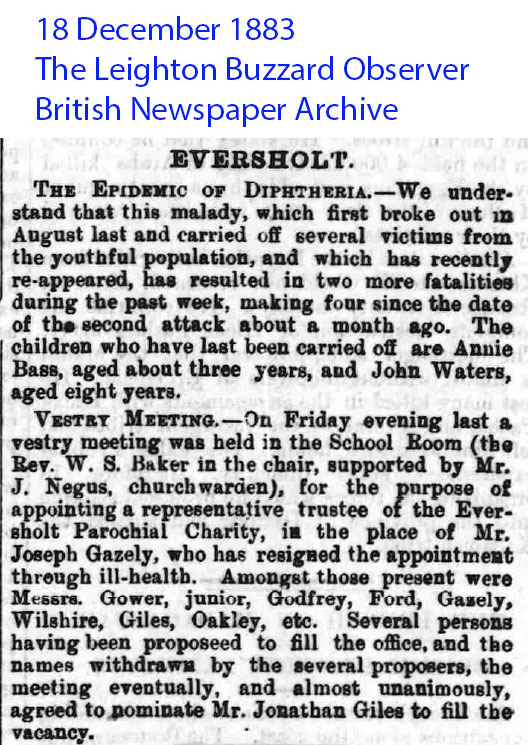 Dr. Parsons’ Report to the L. G. B. on the recent Prevalence of Diphtheria at Eversholt, in the Woburn R. S. D., May 12, 1881. Infection by convalescent unrecognised case. A girl, aged 11, was away from school on account of illness from the end of June to the end of July. She was considered by the medical officer of health to have had diphtheria affecting the nasal passages, from the after effects of which she had not completely recovered when she was seen by him on August 24. On July 23 a school treat was held, at which this girl B. was present. The day was wet, and the children, about 100 in number, took refuge in a cow-shed. Among those at this treat were two children of the village shopkeeper at Church End, one of whom (Case 32) was taken ill on or about July 25. the other on or about July 31 ; both cases were fatal. These were the first recognised cases of diphtheria, but other cases of the same nature occurred about the same time among other children who had attended the treat, and Dr. Parsons considers it “likely” that the infection was acquired there. Scarlet fever and diphtheria in members of same family. It is probable that the infection was introduced into Eversholt by a boy, Albert, who lived at Roehampton, Surrey. Three other children of Albert’s family had suffered at Roehampton from diphtheria in April and May, and Albert himself had had scarlet fever at the same time, but had been kept altogether apart from the others until all were considered to have recovered. There had been other previous cases of diphtheria and scarlet fever at Roehampton, some of them in the families of persons living and working in the same estate as the father of these children. On June 2 the rooms in which the diphtheria patients had been were fumigated with chlorine, and the bedding was stoved in the disinfecting oven of the Wandsworth Board of Works. For a day or two before his leaving home Albert had associated with his brothers and sisters who had had diphtheria. On June 8 he was examined by the family doctor, who considered that he might safely be removed. However, on or shortly after his arrival at Eversholt, he was found to be suffering from sore throat, which grew worse, and on June 12 he was sent away to another relative at Hinton, near Brackley, Northampton- shire, where he died on June 21, the certified cause of death being diphtheria. A little girl living in the same house at Hinton also took diphtheria a few days after Albert’s arrival. Infection communicated by patient in early stage. …A. G., aged 4, living at Tyrrell’s End, had had for a few days what were thought to be symptoms of an ordinary cold. On the morning of November 23 he vomited, but nevertheless went to school that day, though not afterwards. On November 28 his mother, observing white patches on his throat, sent for a doctor, who pronounced his illness to be diphtheria. He had a severe attack, but ultimately recovered. Three of A.G.’s class-fellows (Cases 33, 34, 35), belonging to different families and residing at different Ends, were taken ill of diphtheria, two on November 26 and one on November 28 ; incubation period three to five days.” The inference seems to be allowable that they may have taken the disease from A.G. on the 23rd. Infection from (?) contents of cesspit; infection communicated by patient in early stage. A third outbreak occurred in February. It was traced with great probability to F. F. (Case 36), aged 8, living at Church End within a few doors of the school, who complained of sore throat on February 12, but had been ailing a few days before with what were thought to be symptoms of a common cold. Although so ill that his mother had to sit up with him part of one or two nights, he went to school by day up to and on the morning of February 13, on which day, the nature of his illness being recognised, he was kept at home. Of the five subsequent cases among school-children, four were in the same class as this boy—a different class, and held in a different room, from that in which the November cases occurred. As to the origin of F. F.’s case, he may, it is suggested, have caught the disease by playing with another boy who had sore throat about five weeks earlier. A privy cesspit was emptied at F. F.’s home on February 4, and the contents left in the yard slightly covered with ashes until February 7. Persistence of infection in a house. 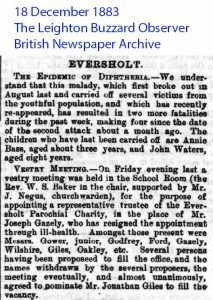 The BMJ of 29 Nov 1884 noted that, in Eversholt, up to March 1884, 41 people had been infected in Eversholt and 13 people had died. 20 households had been affected. In 15 of these, the first affected was a child attending Eversholt school. Dr. Parsons’s report to the Local Government Board on the recent prevalence of diphtheria at Eversholt in the Woburn rural sanitary district [microform] / [H. Franklin Parsons]. Parsons, H. Franklin (Henry Franklin), 1846-1913. Reports to the Local Government Board 1869-1908 ; card 72, 324. 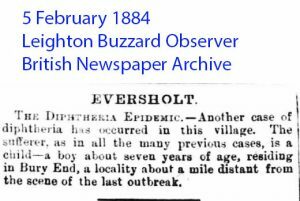 Diphtheria — England — Eversholt. Sanitation — England — Eversholt. Public health — England — Eversholt. Eversholt (England) — Social conditions — 19th century. Report dated: March 24, 1884. Unfortunately, the university of Melbourne does not seem to have any obvious method for ordering a copy. The author was H Franklin Parsons, 1846-1913. Annie Bass, aged 3, and John Waters, aged 8, died in 1883. Walter Bass died of diphtheria infection yesterday morning. Aged 4 years 4mths. Walter (brother to my grandfather) lived in Rads End Lower, Eversholt.